Once upon a time there were 8 million little girls was a little girl who wanted to be Elsa for Halloween. Despite her mother suggesting she dress as Anna or Olaf, she wanted to dress as her beloved Elsa. They searched the land in September for a dress that would be suitable for the little girl but had great difficulty. 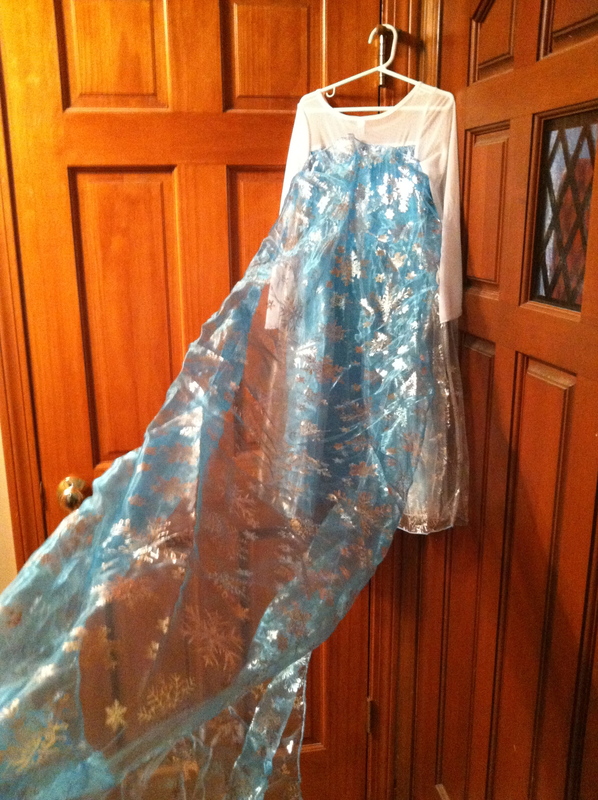 It turns out that affordable size 6 dresses with a train that look like a “real” Elsa dress were hard to come by. Then they entered a magical kingdom called Etsy. An affordable dress just like the little girl wanted could be handmade in the Philippines and sent to the little girl in America by the middle of the September! The mother placed her order and the little girl jumped up and down with glee. About a week before the dress was supposed to arrive, the mother checked in on the order and the shop had DISAPPEARED! What type of magic was this? No more shop….No more money! The kingdoms of Etsy and Paypal would do nothing until the ship date and so another week went by. After this week the shop was still missing and the kingdoms of Etsy and Paypal said there was NOTHING they could do! The shop had disappeared in both kingdoms!!! So with no money and no dress….what was this mother to do?? The mother found a suitable dress in the Kingdom of Amazon and had the new dress within two days. Now she had spent FAR more than she wanted on this Elsa dress and so she went to a higher authority and tried to stop the payment on her credit card for the first dress. In time the payment was reversed, the little girl was happy with her new dress (though it didn’t have the long train) and all was right with the world. Then three weeks later, what should arrive in the mail!?!?!? 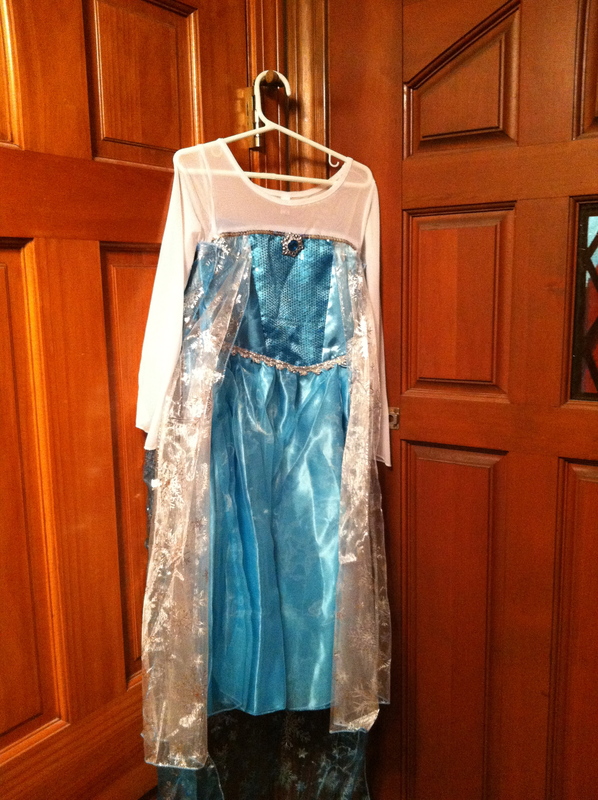 You guessed it….the original handmade Elsa dress! A beautiful crafted work of art with a detachable train. The mother and little girl could not BELIEVE that the shop had reappeared! No note, no explaination….just a beautiful dress for Halloween. Mother called the higher authority and had the charges “reversed” once again. She then looked down at the two Elsa dresses and wondered, “What do I do?? ?” Just then her “fairy godmother” and good friend from down the street offered to buy the dress from the kingdom of Amazon for her little girl. The mother was overjoyed and so grateful to her “fairy godmother” and so the dress was sold. The little girl LOVED her Elsa dress so much and was looking forward to freezing on Halloween night with all of the other little Elsa’s in the Northeast. 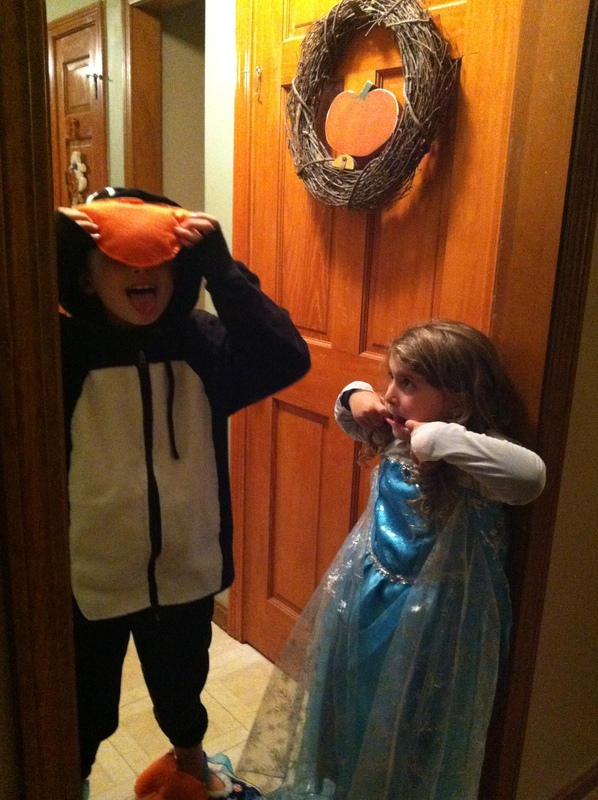 Her brother Sir Penguin would at least be warm in his costume! do NOT need another area of the world in further turmoil. BTW… Do you still have the cape from Amber’s wedding? Might make a nice cozy topper for your frozen princess. Z & C both look real happy! Can Z do the happy feet dance in that costume? As Halloween goes so go the costumes and the nightmares.